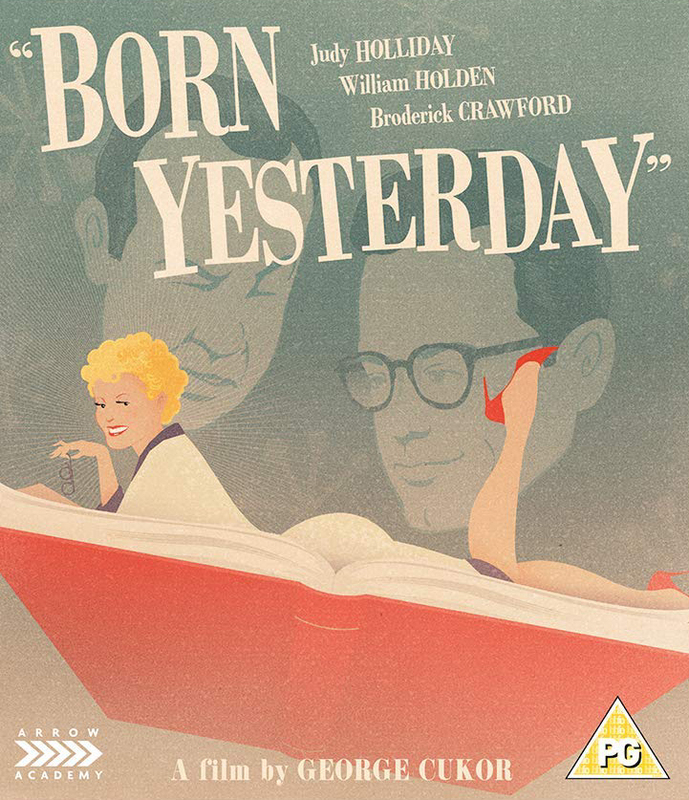 'Arrow Video' have recently released a digitally re-mastered edition of the 103-minute comedy classic, 'Born Yesterday'. 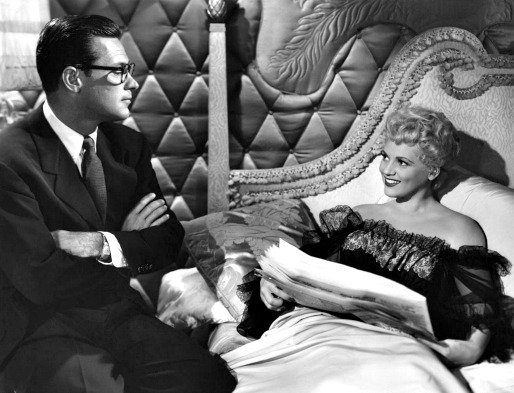 It was directed by George Cukor; it stars Judy Holliday, Broderick Crawford, and William Holden; and it comes with some really great special features. This includes two visual essays, one documentary, an image gallery, as well as the original theatrical trailer. Please enjoy. Hello, Billie (Judy Holliday). Do you remember me? We met yesterday. Only briefly, mind you, because I was interviewing your fiancé Harry (Broderick Crawford) about his current trip to Washington D.C. Anyway, my name is Paul, Paul Verrall (William Holden), and even though I’m a journalist by trade, Harry has asked me to teach you about this great city of ours. Well, as you know, he’s got a lot to deal with at the moment -- business-wise, at least -- and so he thought it would be a good idea for someone like myself to broaden your horizons. For a start, we could go to The White House so you can see how our great nation was first formed, and then, after we’ve done that, we could take in a show or visit an art gallery in order to stimulate you visually as well as mentally. No. I’m not calling you mental, Billie. But in all fairness, I do think it’s important for people to read more books and learn how to use their minds. So, what do you say? Fancy being educated by yours truly? After all, you’re a very special lady, pretty too, and I think I’m starting to fall in love with you. But then again, that’s most probably why what next transpires goes ooooh, la-la, when we both start painting the town, red, white, and blue. As a fiancé takes a savage swing - a pupil always likes to sing - a teacher plans a devious sting - and at the end of the day, please remember, a little knowledge is a very dangerous thing. 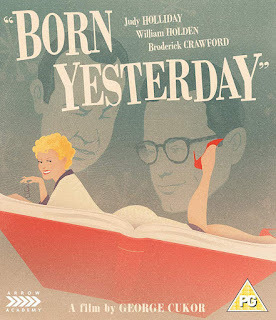 In my most humble opinion, I’d say ‘Born Yesterday’ is a truly wonderful film, because it’s well made, well acted, and well thought out in terms of character development and overall plot. Similar, in fact, to many of the other movies made during this era, the 1950s, which likewise managed to work on a variety of different levels, a political level, a romantic level, as well as a comedic level, all of which tell the tale of how a woman was able to educate herself, thanks to the help of one good man. You see, when the film begins, we’re quickly introduced to the three main characters, plus one main supporting character, Jim Devery, played by Howard St. John, who either help, hinder, or hold each other back, depending on their own individual motives. 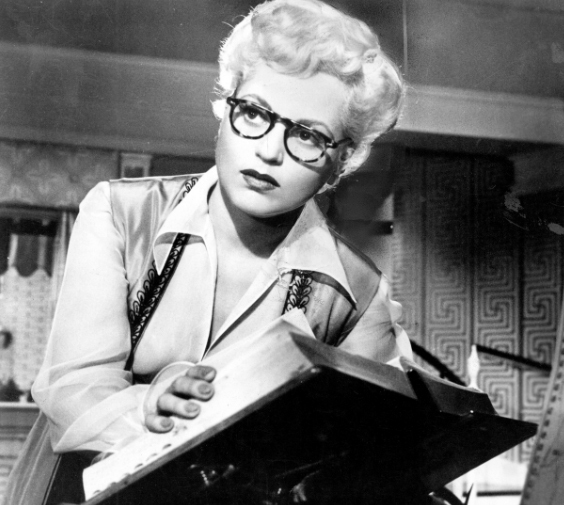 Judy Holliday’s character, for instance, Billie, initially seems like a blonde bimbo who only cares about her looks and her superficial lifestyle. But then, when she comes into contact with William Holden's character, Paul, she starts to realize that her life can be a lot more rewarding if she applies herself accordingly. William Holden's character, on the other hand, doesn’t seem to change at all. Mentally, at least, because he’s basically the same person at the start of the film than he is at the end of it, despite being used as a 'narrative device' to steer Judy’s character in the right direction: Spiritually, at first, before professionally and then finally romantically. And last, but not least, there’s Broderick Crawford's character, Harry, who seemingly acts as the complete opposite of William’s character — a perverse mirror image, so to speak — all because he’s a belligerent bully that cares more about money than the people who surround him. Funnily enough, this point brings me quite nicely onto the tone of this film, which, to some, can seem fairly broad in places and pretty pedestrian in others. Not to me though. No. Not totally, anyway, as I can easily differentiate between the two distinct styles of acting on display. Now, the first style (primarily performed by William Holden and Howard St. John) isn’t very noticeable at face value because it's light, understated, and less threatening in tone. 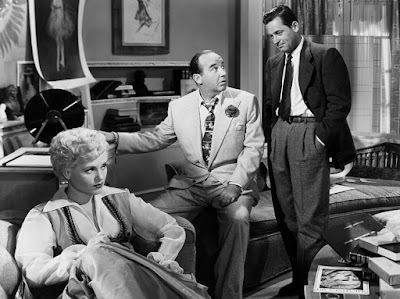 While the second style of acting (primarily performed by Judy Holliday and Broderick Crawford) is louder, funnier, and more cartoonish in comparison, yet still manages to show glimpses of their humanity whenever it’s required. And trust me, it is required, otherwise, the story won’t have enough time to explain who they are, where they come from, or what they’re going to do next. In many ways, this second acting style feels like ‘a theatrical shorthand’ in order to put across their stereotypical rags-to-riches status, (as epitomized by their thick Jersey accents, which I liked, I liked a lot). Anyway, that’s enough of that for the time being. So let us now sit back, relax, and check out the following filmic facts: (1) Columbia first screened this film in New York, New York, on Christmas Day, 1950, and eventually clawed back just over four million dollars at the Box Office. (2) This story was based on a stage play written by the well-known playwright, Garson Kanin, who's best known for working with his wife, Ruth Gordon. Together, the two of them have managed to write some very memorable scripts, mainly for the Spencer Tracy and Katharine Hepburn comedies: 'Adam's Rib'  and 'Pat and Mike' , both directed by George Cukor. (3) Loosely translated, this project was entitled 'Reporter for Intimate Hours' in Germany; 'It is Not from Yesterday' in Austria; and 'Yesterday's Child' in Turkey. (4) Garson always thought it was funny that Columbia Pictures produced this film, because he modeled the part of the obnoxious junk dealer, Harry Brock, after Harry Cohn, the head of the studio, even though he never realized it at the time. (5) A small portion of this film was shot on location throughout the American state of Washington, District of Columbia. This includes such memorable landmarks as The Watergate Steps, The Jefferson Memorial, The Library of Congress, The National Gallery of Art, The Statler Hotel, and The United States Capitol, situated on 545 Seventh Street SE. (6) One of the taglines used to promote this picture, states: 'I got everything, two mink coats, an OSCAR... everything!'. (7) When Garson first wrote this story for the stage, the part of Billie Dawn was originally intended for Jean Arthur. But, a few nights before the play was planned to open, Arthur abruptly dropped out and was quickly replaced by Judy Holliday. Coincidentally, Arthur dropped out of the film version too, along with some other notable actresses, including Lana Turner, Rita Hayworth, Celeste Holm, Marie McDonald, Evelyn Keyes, Paulette Goddard, Ida Lupino, and Marilyn Monroe. 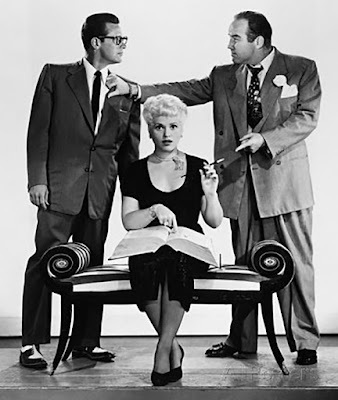 (8) After this flick fluttered its eye-lashes, Judy Holliday starred in another Kanin comedy, 'The Marrying Kind'; Broderick Crawford starred in the film-noir, 'The Mob'; and William Holden starred in the military movie, 'Force of Arms'. 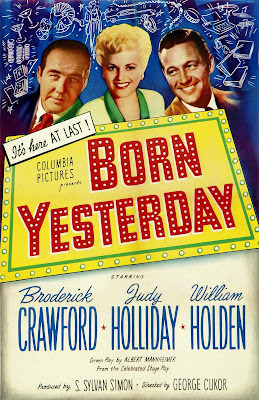 Now after I finished watching ‘Born Yesterday’, something rather peculiar popped into my mind. Metaphorically speaking, of course, and basically boiled down to me asking myself a couple of troubling questions. I mean, as mad as it may sound, could this film possibly act as a precursor to this current metoo / Trump generation? After all, it is about a woman being spiritually repressed by a powerful man as well as the follies of political corruption! And if that were true, does that mean we’re living in an ignorant society and need to be educated accordingly? Saying so largely due to the notion it presents in regards to believing what the media says! Well, according to this flick, we should believe the media, no matter what form it takes, as they’re generally willing to stand up for the common man (or woman, in this case) by instructing us to read a selection of books published in the late 18th century. But then again, has anyone ever read a book published in the late 18th century? I have, quite a few in fact, and they’re not easy to read because they’re commonly pious in diction and convoluted in tone. Come to think of it, how on Earth could Judy Holliday’s character have even understood these books if she was initially portrayed as a dumb blonde? It doesn’t make much sense, does it? The whole notion that an uneducated woman can educate herself by reading complicated literature that’s over two hundred years old (despite using a dictionary)! Although, on second thoughts, I suppose we’re meant to ignore this fact and just go along with the movies basic message -- that being, respect education, respect history, and respect the values of those people who came before us: Which makes sense, up to a point, but doesn’t really conform to today’s sensitive standards!